The New York State Board of Regents is engaged in an effort to better align the State's early care, preschool and early childhood educational policies and create a comprehensive plan to ensure that all children in New York State get a healthy start from birth, become ready for Kindergarten, stay on track to graduate from high school, and are successful in life. To this end, in 2017 the Board of Regents Early Childhood Workgroup established a Blue Ribbon Committee of over 60 national and State experts who have developed recommendations to address early care and education in New York. The following Report, under the direction of the New York State Board of Regents Early Childhood Workgroup, reflects a deliberate and comprehensive process designed to give all children in our State the fairness of an even start. Opening a New School: For questions and assistance with opening/starting up a new school, please visit the Office of Nonpublic Schools website. Starting a UPK program (.pdf) This document provides information on how to become a UPK provider. New York State Prekindergarten Program Directory (.pdf) This list contains updated contact information for New York's prekindergarten programs. Nursery Schools & Kindergartens: For a directory for all nursery schools and kindergartens voluntarily registered with NYSED, please visit our directory web page. The New York State Education Department’s firm commitment to a P-12 educational system has been reaffirmed with the establishment of the Office of Early Learning (OEL). The Office of Early Learning frequently receives questions from school districts and community-based organizations on the Pre-K staff coverage requirements. The above memo provides clarification regarding the staff coverage requirements for prekindergarten (Pre-K) classrooms operated under State-Administered Pre-K grant programs. The Office of Early Learning frequently receives questions from school districts and community-based organizations on curriculum for prekindergarten programs. The above link provides an overview of the instructional cycle, defines evidence-based curriculum, and provides criteria that may be considered when selecting or developing curriculum for prekindergarten programs. On April 3, 2017, the Board of Regents approved the use of the Pre-K EMLL Language Profile (available in 24 languages) and Process (.pdf) to guide and support state-funded Pre-K programs in implementing best practices relative to identifying and supporting home languages for Pre-K EMLLs. The intention is to mitigate multilingual children losing their home language skills during their acquisition of English in Pre-K. 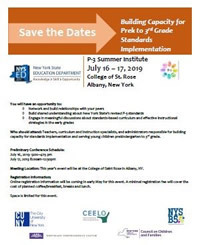 Questions regarding the Pre-K EMLL Language Profile and Process may be directed to Michele Kinzel-Peles in the Office of Early Learning at (518) 474-5807 or by email at oel@nysed.gov. For more information, visit the Emergent Multilingual Learners in Prekindergarten Programs web page. This guide is intended to assist administrators, teachers and paraprofessionals in differentiating instruction for three year old students from that for four-year old students. Use this guide to navigate the special education system for children from birth to third grade. It includes an overview of the Early Intervention Program (EIP) and programs and services available to preschool children and school age students with disabilities in New York State. Some children who have diagnosed conditions, or disabilities that are medical, physical, develop-mental or psychological may need more support to progress in one or more developmental areas. *Please note that the PDF format must be submitted as the original fillable form. This allows OEL reviewers to provide comments and questions in the SED Comments box and return it to for clarification or revision. Therefore, any submitted scanned PDF files will be returned. Section 3602-e of Education Law has been amended to require that all school districts receiving any State and/or federal prekindergarten grant must adopt approved quality indicators within two years, including, but not limited to, valid and reliable measures of environmental quality, the quality of teacher-student interactions and student outcomes. In addition, grantees must ensure that assessments of child outcomes will not be used to make high-stakes educational decisions for individual children. Specifically, such results may not be used to preclude or discourage the enrollment of a child in kindergarten. These requirements apply to districts receiving one or more of the following Pre-K grants: Universal Pre-K (UPK); Targeted Pre-K (TPK); Statewide Universal Full-Day Pre-K (SUFDPK); Expanded Pre-K (EPK); Prekindergarten for Three-Year Olds (3PK); Additional Grants for Expanded Pre-K (EPK2); and federal Preschool Development Expansion Grant (PDG). Please see the above Guidelines file for more details. *Please e-mail your completed self-assessment and action plan to OEL@nysed.gov. Planning for High-Quality Prekindergarten Programs reflects the commitment of the New York State Education Department to continue to work toward increasing the availability of high-quality prekindergarten programs. The purpose of this document is to provide guidance to those responsible for planning and implementing prekindergarten programs for three- and four-year old children. It provides a framework for teachers and others who work with young children to create environments and develop curricula, instruction, and assessment strategies that support children as learners. It is based on the recognition that teachers need many and varied opportunities to nurture and refine their craft in order to respond effectively to the diverse needs of the children with whom they will interact during their teaching careers. In collaboration with Head Start and the New York State Association for the Education of Young Children, the New York State Education Department’s Office of Early Learning has developed a webinar to provide guidance to school leaders on promoting best practice in early childhood education. The New York State Education Department is one of the members of a State Leadership Team created to provide support to the early childhood field on an evidence-based framework – The Pyramid Model Program - designed to build a child’s social and emotional competence and reduce a child’s challenging behaviors in early childhood educational settings. The State Leadership Team is currently seeking master trainers from across the State to be a part of the implementation of this model. This master cadre of trainers will receive 10 days of professional training on the Pyramid Model modules and would be required to commit to providing 15 days of training per year for at least 3 years for center directors, principals, teacher supervisors, early childhood coaches, family support supervisors, and others across the State. Interested candidates please click on the links below for further details. Our Prekindergarten Professional Development Needs Survey indicated a strong interest in integrating all domains of early learning. This resource provides an overview of integrated instruction, a topic that is applicable to all grade levels. Getting Ready for School: Healthy Bodies & Healthy MindsMeeting the health and nutrition needs of your preschool child and establishing regular routines is important for your child’s success in school. The Healthy Bodies and Healthy Minds tip sheet provides families with strategies for starting the school year. Districts can download this resource, customize it with the district name and date, and distribute it to families. Getting Ready for School: Play provides families with strategies for using play in the home. Districts can download this resource, customize it with the district name and date, and distribute it to families. Tip Sheets for Practice and Play: Setting Up Learning Centers provides helpful strategies for arranging the prekindergarten classroom to ensure a developmentally appropriate environment and facilitate the integration of instruction across the five developmental domains. Art experiences allow children to express their ideas, feelings, and knowledge in visual form. Offering a daily art center that is equipped with open ended supplies encourages this. Students explore the processes of art using materials, tools, and techniques and create products such as drawings, paintings, sculpture, collage and three dimensional art. The list provided here includes the types of materials found in a quality preschool classroom and offered in the art center on a rotating basis. Building relationships, partnering and collaboration are extremely important to facilitate the transition of prekindergarten students to kindergarten. This is a time of great change for children, parents, families and schools in which new relationships, new expectations and new competencies are being developed. The local school district should have a comprehensive plan for supporting its newest incoming students and their families as they transition into a K-12 system. The checklist below will help to determine how complete your school district’s prekindergarten to kindergarten transition plan is. It may signal areas for improvement for your district to work on to ensure a positive start for young children in the school community. The Office of Early Learning, in partnership with the Northeast Comprehensive Center, developed a set of tools to support the implementation of the Prekindergarten Foundation for the Common Core in New York State’s early childhood education programs. These tools are intended to support teachers, coaches, specialists, and school leaders in reflecting on current practices for each early learning domain.